Dormel Farms has an extensive past. Filled with stories of life, death, wealth and demise, this beautiful property continues to thrive and add a little piece of history as it sees itself well into the twenty first century. Absalom Casebeer was the earliest settler known to the homestead. In 1790, the two story brick home was built. As a respected farmer and weaver, Absalom's large orchards and extensive sugar camps were considered to be some of the county's finest. John N. Casebear, one of the eight children of Absalom, inherited the farm. He and his wife Mary built the barn in 1837. John donated the land from this farm for construction of the first Casebeer Lutheran Church in 1845. Subsequent owners of this property included A.J. Casebeer (prior to 1862), Daniel Shaffer (1846-76), Joseph Shank (1876-83), Elias G. Bittner from 1883-1906. Bittner was hurt in a farming accident and did not want the farm to go to just anyone, so his daughter and son-in-law came from Pittsburgh to run the farm. Simon Baker and his wife obtained the farm in 1906. Pauline Ferguson, daughter of Simon, resided in a quaint home just beyond the farm's border. 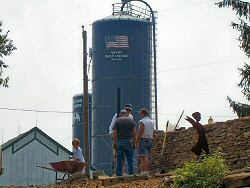 The farm was then sold to Mr. Clark Miller, a family relative. After farming it for 25 years, it was sold to the Moore family. Short lived due to health reasons; the farm was then put back on the auction block. In April 1963, Melvin and Dorcas Arnold, along with Melvin's father Albert, purchased the farm. In 1986, William, son of Melvin and Dorcas, joined his father and continued the long history of dairying. In 1998, William entered into a purchasing agreement for Dormel Farms. 229 years have passed since the first was made to build our humble home. We are very proud of its heritage and feel its future has a lot to tell. Our thanks to all who were involved in the rescue effort of our nine neighbors who have now become family. Our hearts go out to the nine miners who courageously fought their way out, only to join the rescue, bringing their buddies home. We will always be indebted to the eighteen men who showed their courage when courage was needed by all. Our prayers will always be with you. Our gratefulness to God.